mama elephant | design blog: More projects by our guest Heather Campbell! More projects by our guest Heather Campbell! The talented Heather Campbell is back today to share with us her final projects as the guest designer for us this month. True to form, her cards are as delightful as she is. Thank you for sharing yourself with us, Heather! Hi everyone! I'm back today with my final post as the August guest designer. Thank you so much to Kryssi and the entire team for having me! It has been such a treat! The first card I'm sharing today uses Many Thanks, which is absolutely full of thankful goodness. I absolutely love sets like these because there is a perfect sentiment for every thankful occasion. To create this card, I pulled a sentiment from Many Thanks and simply added a little coloring to the inside of the sentiment. Then, I added my favorite little heart, which is from the new Foodie stamp set and stamped a border from Basic Borders. My last card is one I've been so excited to share, using the Bootastic set. I know I gushed about how much I love Bootastic during the Stampede but seriously I adore Bootastic. Those little trick-or-treaters are just too cute and that princess could be used for other occasions too. Again, I used Basic Borders to ground my images. That's it from me today! Thank you so much for letting me join you today! I hope you have a great day! LOVE these cards! Heather is super talented! What adorable cards!! I love the style!! Those colorful hearts are toooo perfect!! And that little mummy is beyond adorable!! Eek!! Enjoyed all your cards this month. Just lovely. 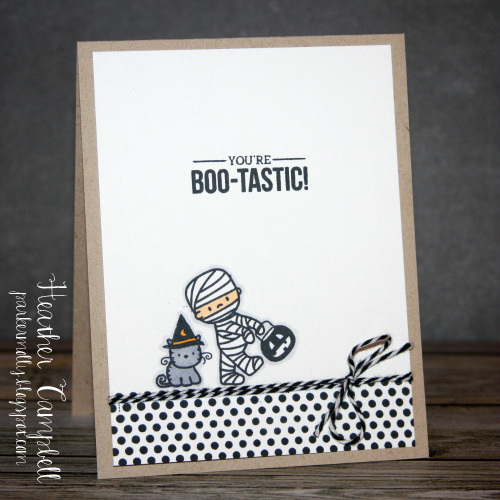 Cute cards - love the Boo-Tastic set with the little mummy.